Vajra Station Canteen, Jalandhar Cantt. has given a notification of 13 Assistant Manager, Billing Clerk, Sales Attendant, Helper, Safaiwala and other Jobs on the contract basis. 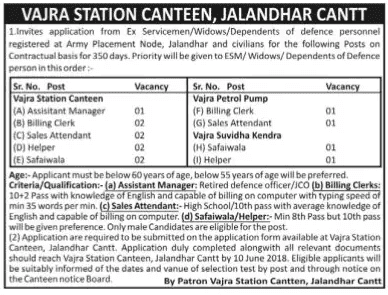 The interested candidates can apply for the Vajra Station Canteen Jalandhar Cantt. Recruitment 2018 on its due date. 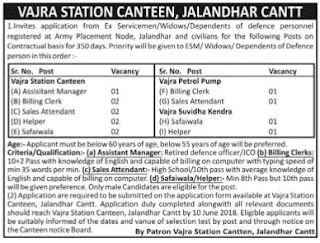 Jalandhar Vajra Station Canteen Recruitment 2018-19 notification is out. As per the Notification, there are 13 Assistant Manager, Billing Clerk, Sales Attendant, Helper, Safaiwala and other Jobs. The educational qualification for is 8th Pass, Matriculation and 10+2. The age limit is 60 years. If you are looking for Jobs in Jalandhar Cantt. then this article is going to be very helpful for you. Assistant Manager: Retired defence officer/JCO. Billing Clerks: 10+2 Pass with knowledge of English and capable of billing on the computer with typing speed of minimum 35 words per minute. Sales Attendant: High School/10th Pass with average knowledge of English and capable of billing on the computer. Safaiwala: Minimum 8th Pass but 10th pass will be given preference. Only male candidates are eligible for the post. Applicant must be below 60 years of age, below 55 years of age will be given preference. You can send your application along with all the relevant documents at the Vajra Station Canteen, Jalandhar Cantt on or before 10 June 2018. Last Date: 10 June 2018.